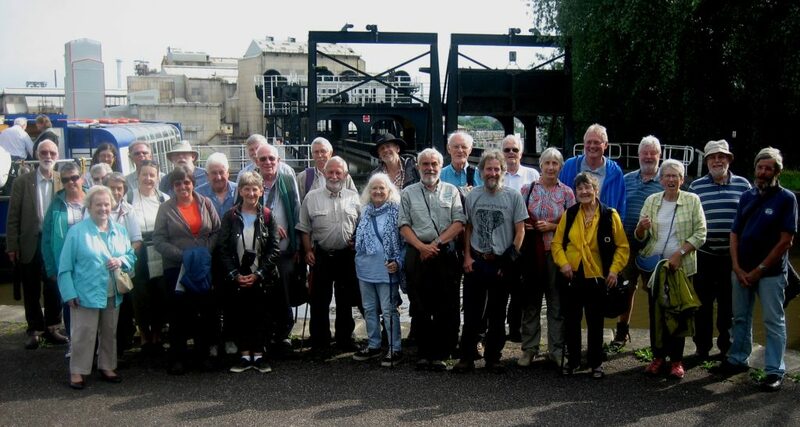 This was the second canal non-walk, as it has now been christened, that we’ve organised and it was great to see several retired walkers and welcome new members to the group. 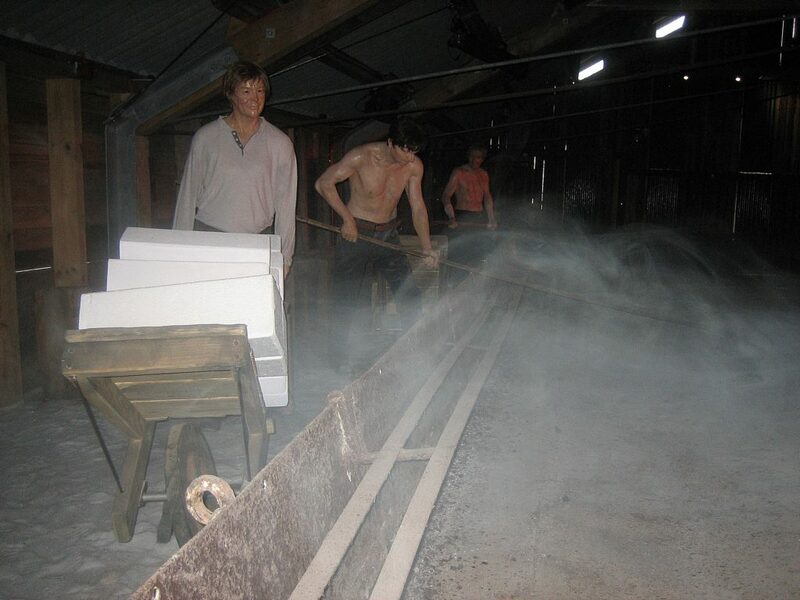 The morning’s visit to the Lion Salt works was fascinating – who would have thought salt could be so interesting? After a welcome by museum staff we were given a brief history and explanation of the site before setting off to explore at our own pace. 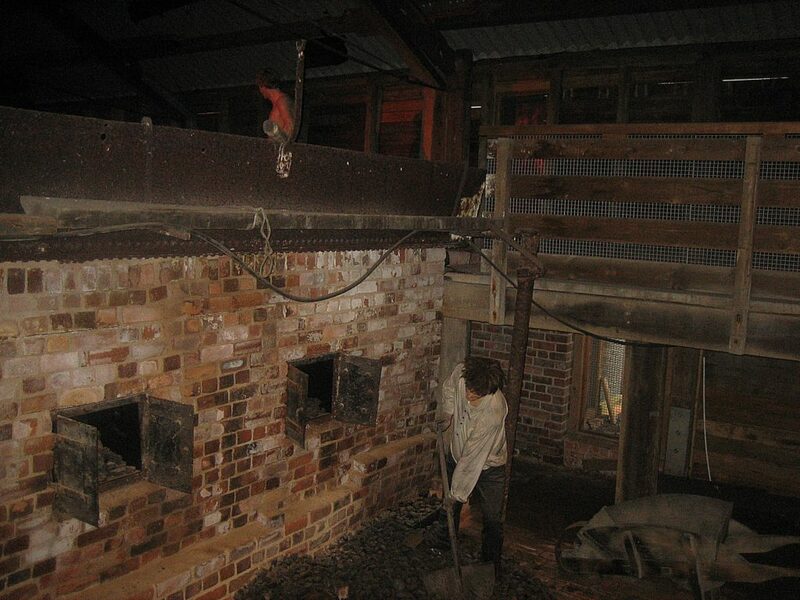 Lion Salt works ran as a business from 1894 until 1984. It was built over an underground brine stream, formed where ground water has dissolved salt layers. The brine was pumped up to the salt works by a ‘nodding donkey’ driven by a steam engine. These are planned for restoration in the future. The salt was then piped across the site to a holding tank and thence to the salt pans. During the restoration a tunnel under the site was found, running from the canal to the centre of the site which was so crowded with buildings this made moving coal from the canal much easier. Next on the tour is the original Red Lion Inn (from which the works takes it’s name), now filled with displays which take the visitor through 2000 years of salt-making, explain the ‘wiches’ of Cheshire and has a recreated office, bar and wallers hut. After the Red Lion are the pan and stove houses. Pan house No3 shows what it would be like to work there (thankfully without the heat) and has images projected onto the wall and roof, creating an interesting display. In the stove houses salt would be stacked to dry. Although a new framework supports the building it was good to see the old cast iron structure left in situ. 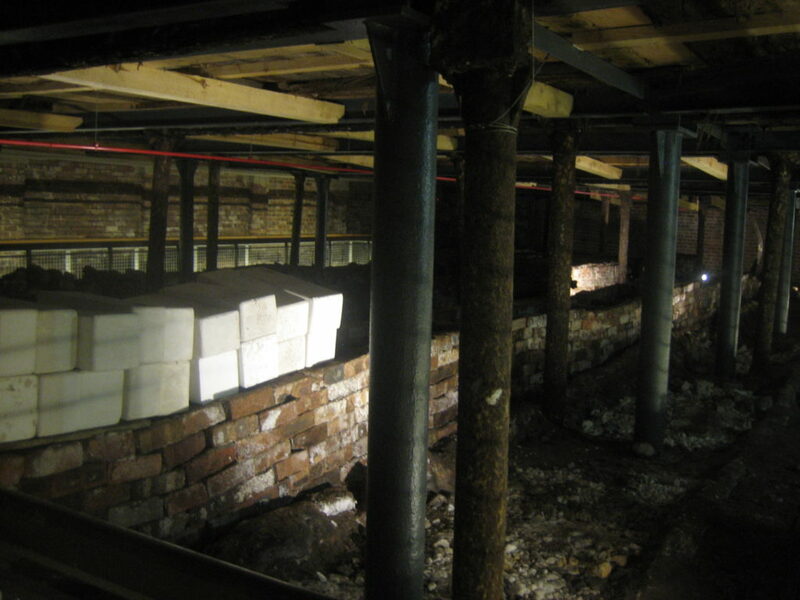 After this there are displays showing the processes of drying, cutting and packing the salt as well as interactive galleries, where the young at heart can have a play, plus illustrations of the impact the extraction of salt from underground had on the local area, causing subsidence and creating flashes. 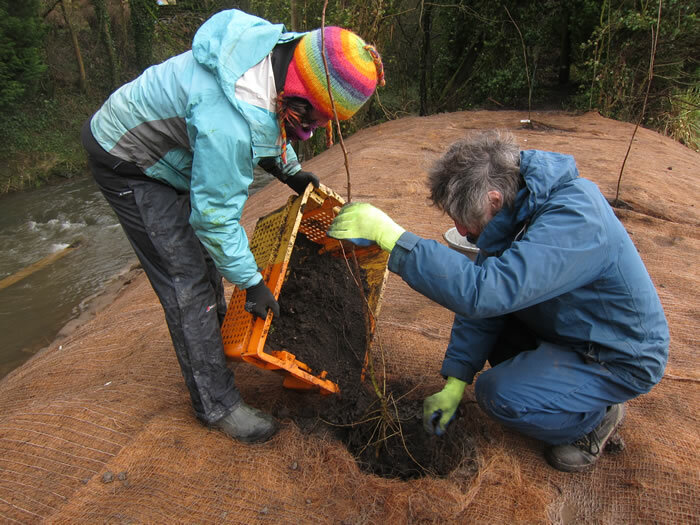 Then onto present times – fascinating information about the restoration and how nature has reclaimed the ‘waste howling wilderness’ that had been damaged by pollution from industry – even flashes that were filled with industrial waste. From here it is a short drive (or 2 mile walk) to the Anderton Boat Lift which had taken the salt boats down to the River Weaver. Here we had a very leisurely lunch and plenty of time to catch up with friends old and new as the trip had been delayed by a computer fault. Luckily by this time the weather was fine and warm and it was a very pleasant spot to wait overlooking the river. The Edwin Clarke eventually descended the lift and we were finally able to board for a pleasant trip up the river to Northwich, passing Tata chemicals (formerly part of ICI), a sunken concrete boat, and the remains of a wharf now well hidden by reeds. 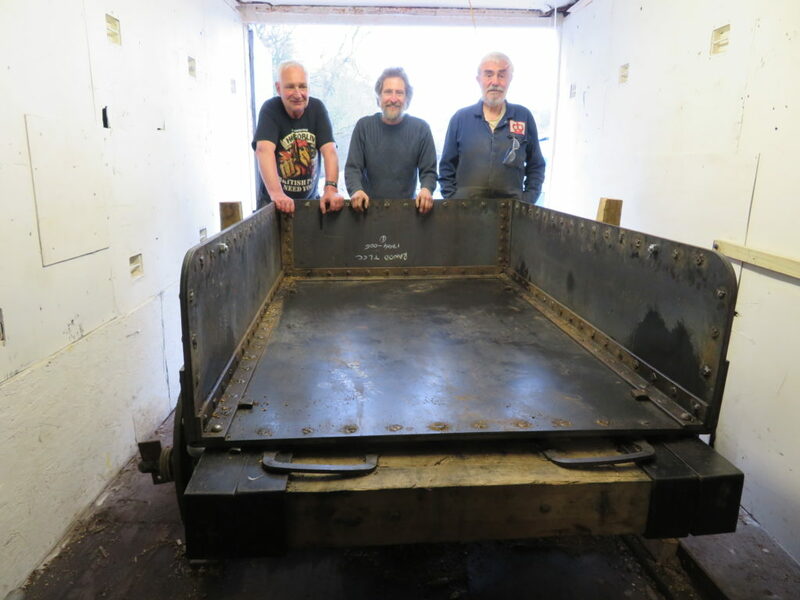 The boat returned to Anderton for the most exciting part of the day – ascending the lift. The lift never fails to impress and being in the trip boat we had the added benefit of a commentary explaining how the operation of the lift had changed from counter balanced hydraulic to electric with counterbalanced weights when the cast iron hydraulic rams corroded, accelerated by the action of the high salt concentration in the water. Now the lift has electrically powered hydraulic rams, which can be operated independently or counterbalanced. The rams now are made of stainless steel with a ceramic coating to protect from corrosion. On reaching the top there is a wait while water is pumped between the caisson gate and the aqueduct gate. These are lifted for the boat to pass onto the aqueduct then lowered again before the gate at the canal end of the aqueduct can be lifted – a safety feature of the lift. We had thought this would be our last non-walk but having been asked many times where next year’s is going to be it seems not! 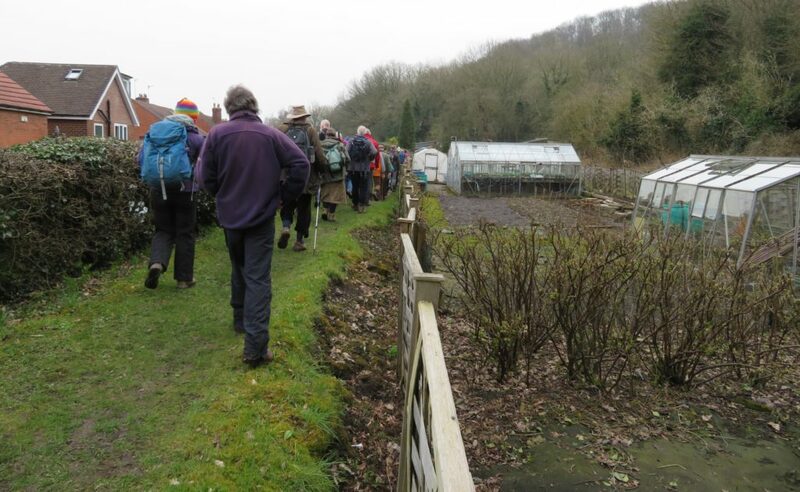 Having met in Ripley our rather large group pretty much filled the bus which took us to Crich market place from where Trevor Griffin, mastermind of the Butterley Gangroad Project, was to be our guide for the Gangroad section of the walk. 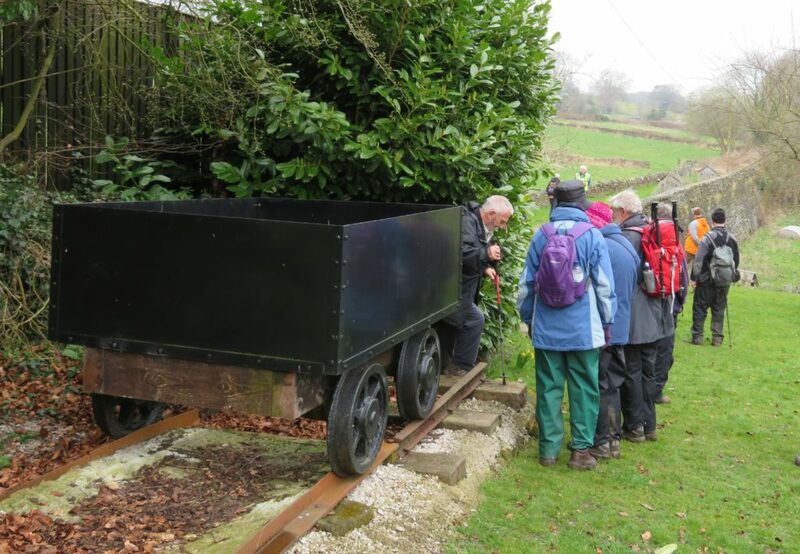 The project gained HLF funding to interpret and disseminate information about the railway, the associated quarries and limeworks and investigate the tunnel, providing a more accurate picture of the railway. Butterley Gangroad was first used in 1793 by Benjamin Outram & Co to transport limestone from Warner (Old) Quarry to the Cromford Canal at Bullbridge. During later improvements the line was straightened and connected to Hilt’s quarry. 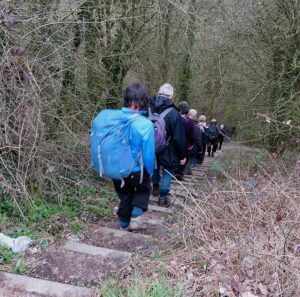 The walk closely follows the route of the Gangroad and many of the landowners are very supportive of the project, which became obvious as the walk progressed. The route starts at the gates of Hilts quarry which is now owned by Rolls Royce and which they have used as a dump for low level nuclear waste, generated from their building of reactors for powering nuclear submarines. From here we walked down a 1 in 15 gradient which was originally a self-acting double track incline, singled in 1894 for use by locomotive power. At the bottom of the incline the Hilt’s Quarry branch joined the original gangroad. Climbing over a stone stile, we stood on the original line and then walked down to the road crossing which was originally a tunnel under the road. Here the cottage (now called the engine shed) has a good deal of gangroad memorabilia in the garden including a patio supported on the iron beams taken from the roadway bridge when it was demolished. 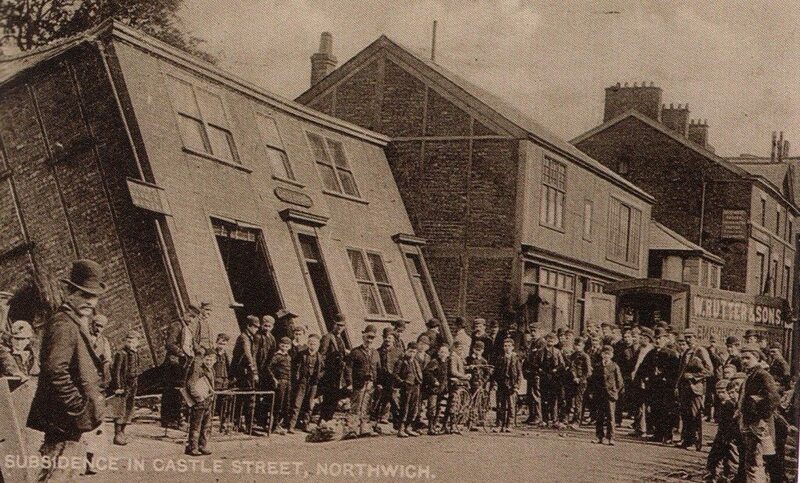 Opposite this is a large building, now private houses, which was the hat factory and workers cottages. 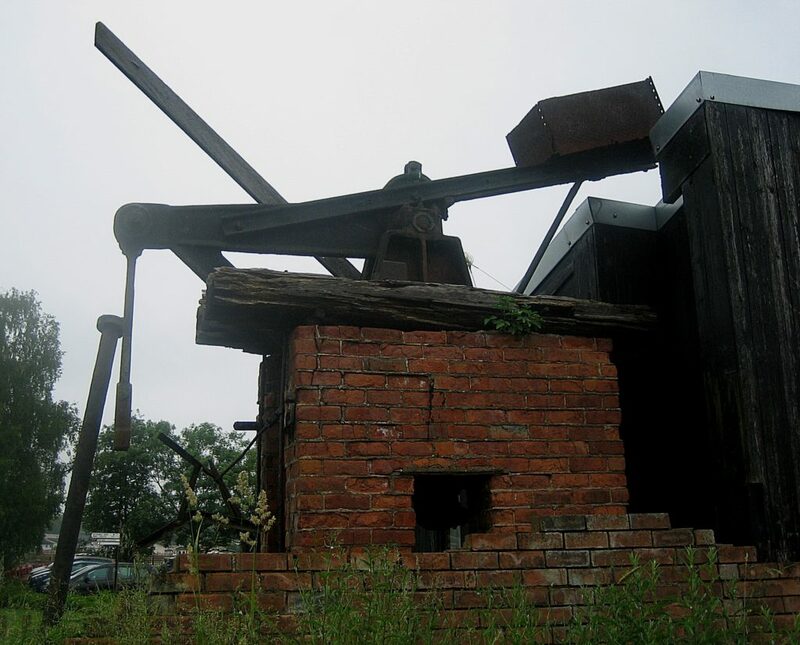 It is believed that the factory would have been making miners hats. We soon left the road and cut up through a field from where we viewed an embankment which is part of the new line, constructed when the tramroad was converted to a steam hauled railway, running between stone walls. We could also see the old contour line following the line of the tramway. Crossing a stone bridge which crossed the later route we progressed to Fritchley and the world’s oldest railway tunnel. About 90ft long, the tunnel passes under the road. The portals are now buried but the north portal was opened up in 2013 for a survey to be done as part of the project. At one side of the road a representation of the type of waggon that would have run on the line is situated close to the railway line and next to interpretation boards. 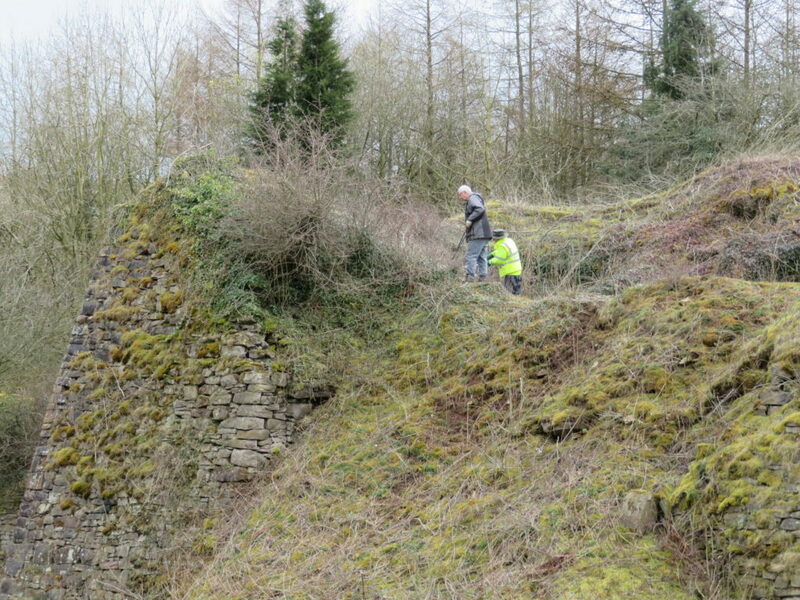 After passing the limework managers house, stables and yard we passed under a Butterley Ironworks bridge, heavily stabilised, which would have carried the railway into the limeworks yard at Bullbridge. Here the railway met the Cromford Canal at Amber Wharf and the burnt lime was loaded onto boats or rail wagons for transportation. 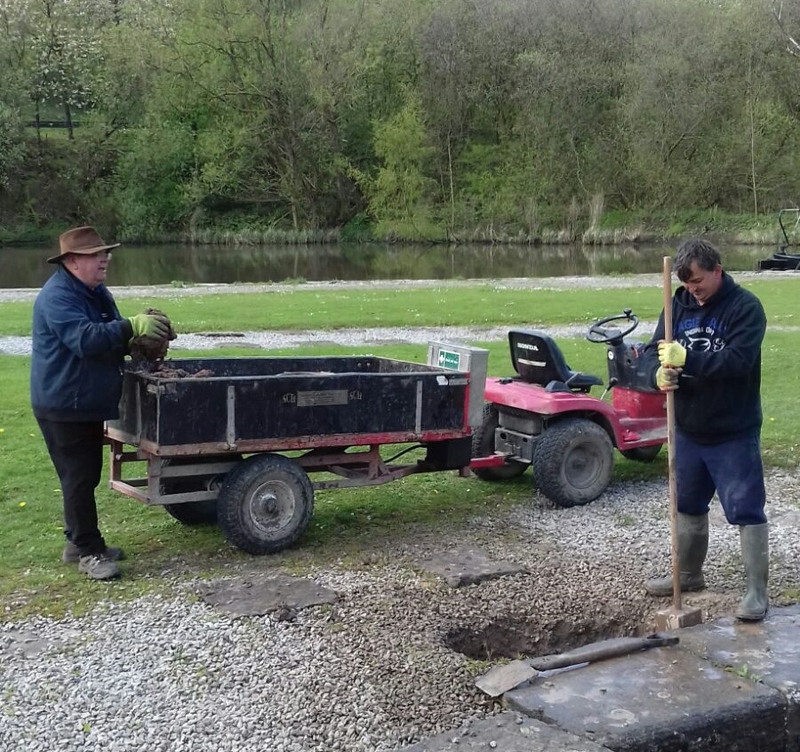 At this point Trevor left us and Hugh took over as guide to take us along the Cromford Canal to Butterley. From Bullbridge Wharf Bullbridge (or Amber) aqueduct took the canal across the Amber valley. 30’ high, it crossed the river, road and later the railway, surviving until 1968 when the road was widened and the aqueduct demolished. To join the canal we crossed the railway and then braved the A610, where Paul took his life and walking stick in hand to stop the traffic for us to cross. Immediately after the aqueduct the canal turned sharply; there is now a house on this site which has the original dry dock in it’s garden. Unfortunately there is also a high fence running across the canal. The canal runs on a high and very steep embankment here with houses along the bottom, making us wonder how residents would feel to have a canal full of water above them. Next we reached a gauging narrow, which the society have been clearing. Originally a toll house stood here, the entrance gateposts remain. 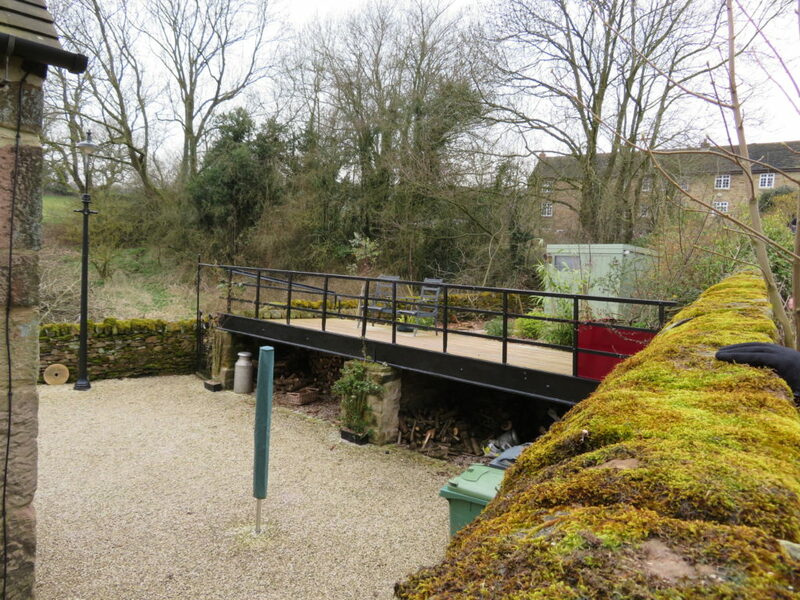 After Brickyard bridge there is a section of canal that was sold off piecemeal in the 1960’s to local home owners. This is now covered in allotments and cars. 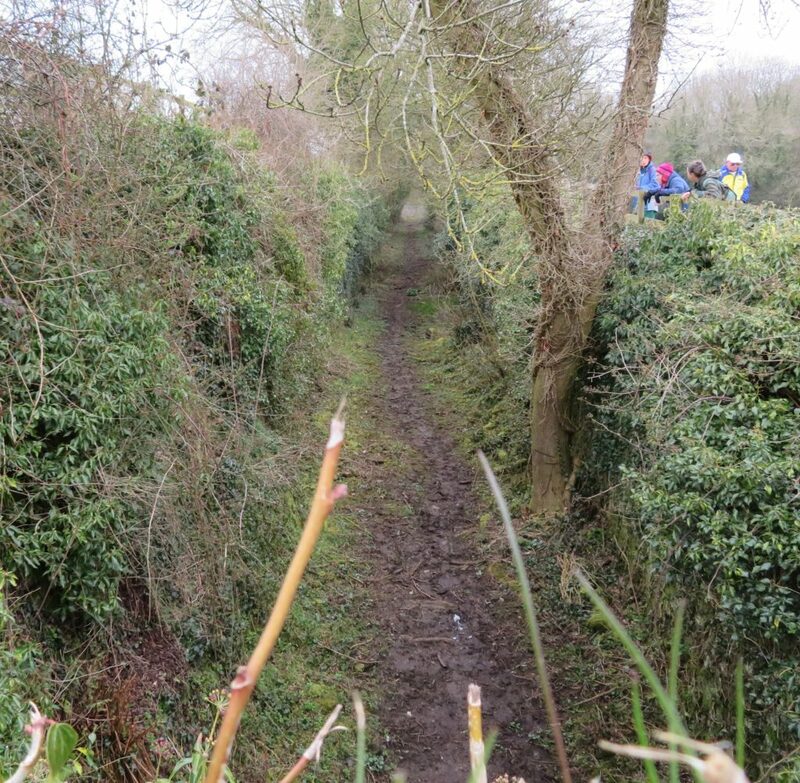 To the side of this is an old railway line which could provide an alternative restoration route, thus bypassing the problems that are foreseen in restoring the original route. After passing through Buckland Hollow tunnel, which, although the channel is infilled, appeared to be in good condition, we were all pleased to reach our lunch stop at The Excavator pub, formerly Ladybank House, the offices of G. Wheatcroft & Co, canal carriers, who had put on a delicious carvery for us. Suitably replenished we set off for Butterley Tunnel. 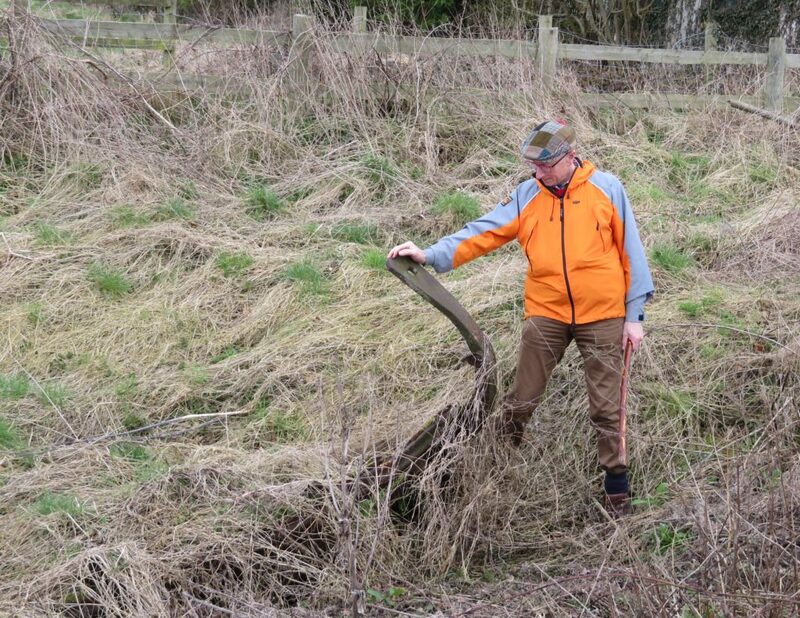 We soon reached a short section in water, although only because it is being used as a fishing lake, then saw the remains of a working boat embedded in the canal bed. We followed the dry—ish intact canal bed to the entrance to Butterley tunnel, having scaled the heights of the A610! 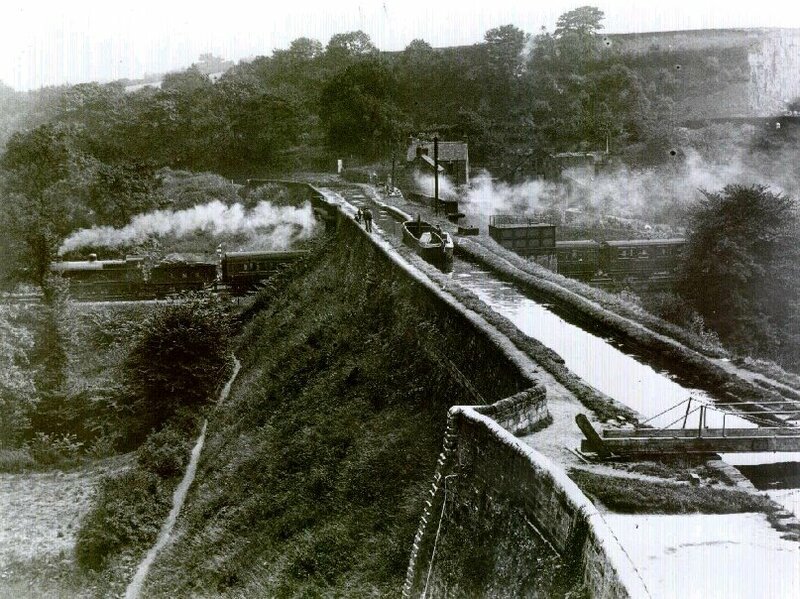 At 2,966 yards, at the time of building Butterley tunnel was the third longest canal tunnel in the World after Sapperton and Dudley. 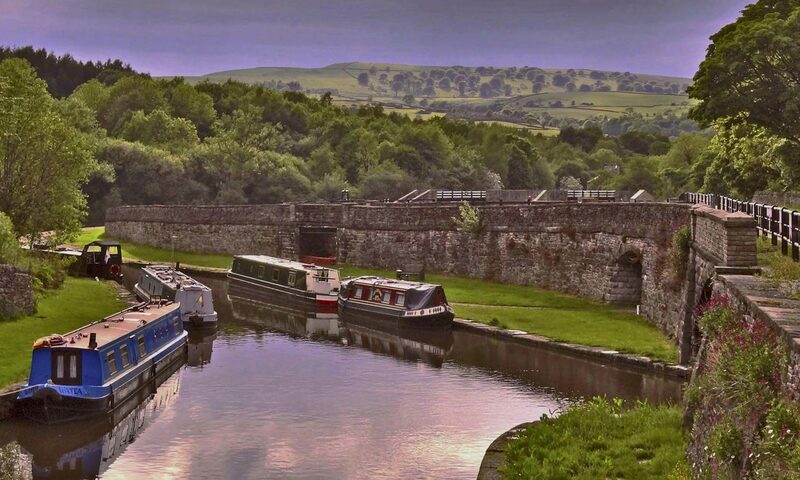 It has an underground wharf from where a horizontal tunnel ran to the Butterley Company’s Butterley Carr Pit which opened in 1812 and loaded its coal directly into narrow boats at the underground wharf. There were also vertical shafts from the wharf which allowed goods in tram boxes to be lowered directly from and lifted up to the Butterley Company’s works (on the hill above the tunnel) to and from the underground wharf. 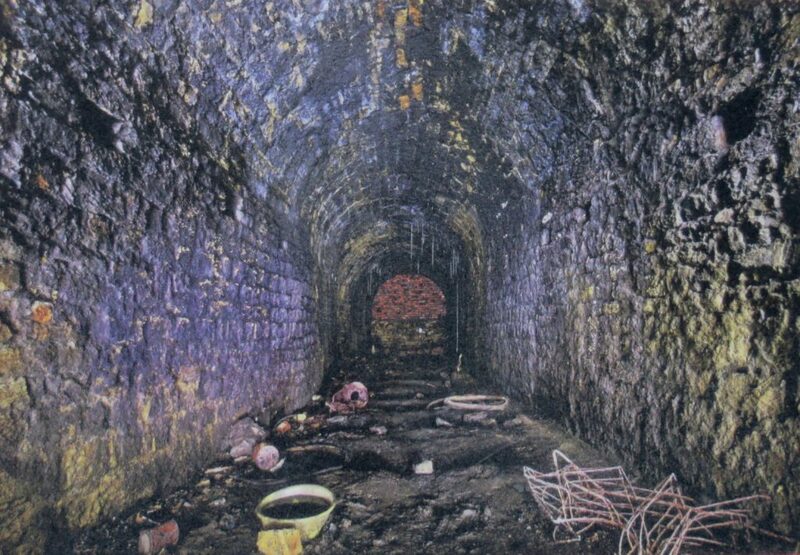 The tunnel suffered from subsidence and closed in 1900 thus splitting the canal into two separate sections. The tunnel was extended when the Ripley bypass was built, but with only a 5’ diameter section of corrugated steel. 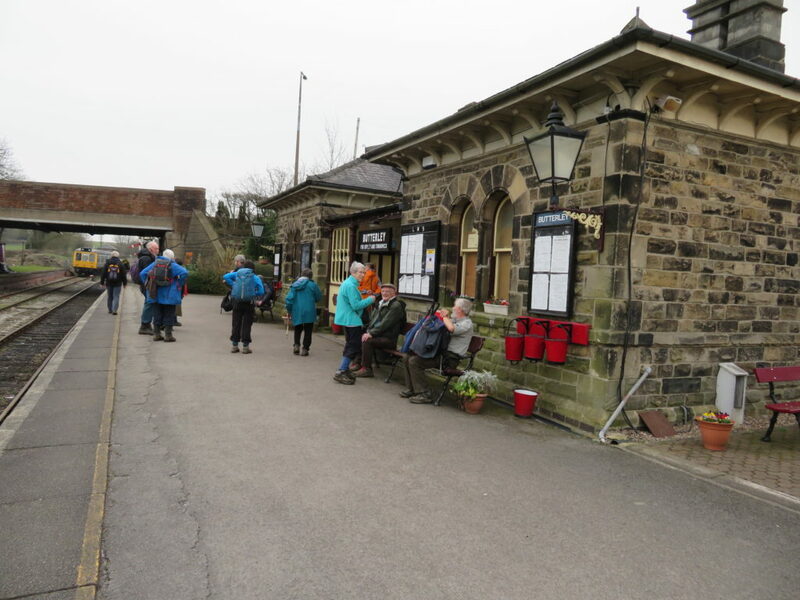 On the final part of the walk we visited the Midland Railway Centre station at Hammersmith and the Butterley reservoir. 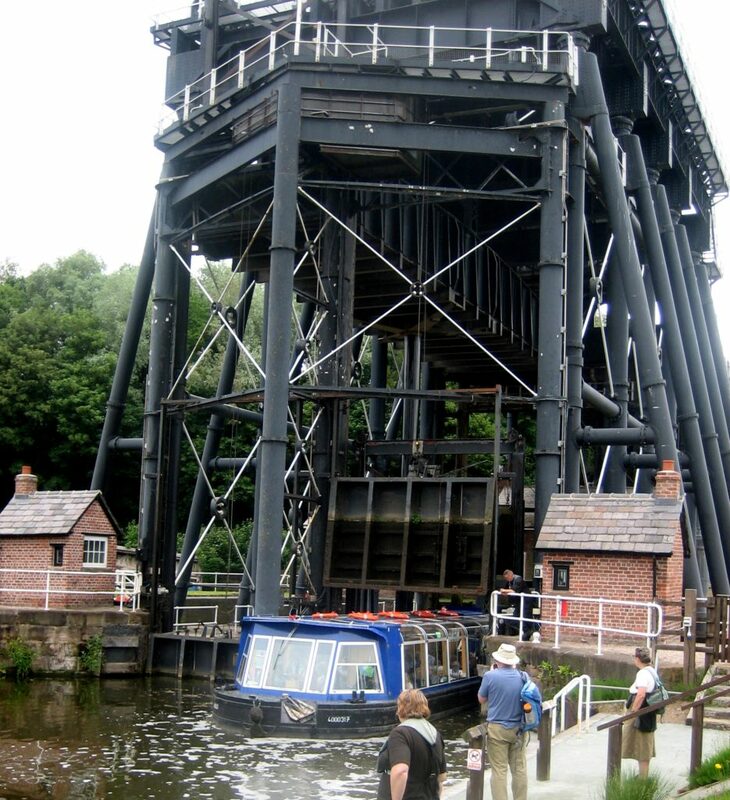 This was built by the Nottingham Canal Company and the water delivered there very conveniently via the Cromford Canal. 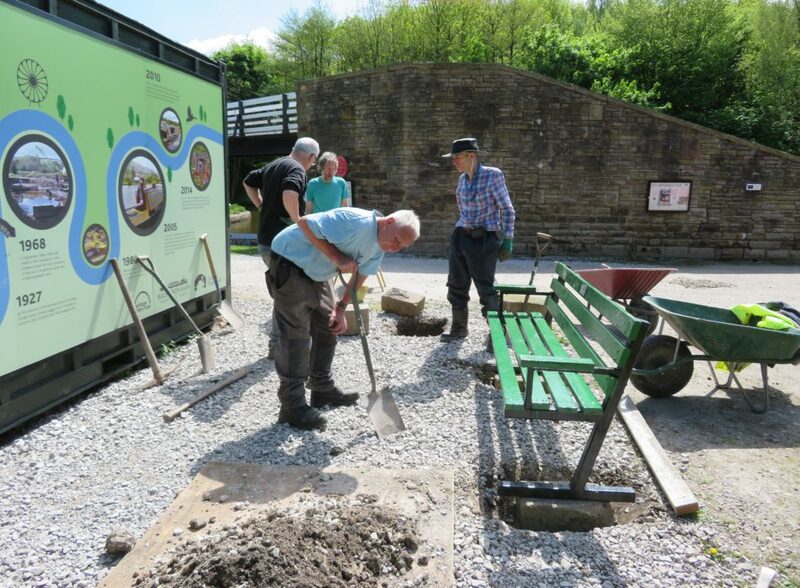 We finished at the Midland Railway Centre’s Butterley station, from where it was a short bus journey or walk, past the remains of the Butterley Company works, back to Ripley. Many thanks to Hugh for organising such a varied and interesting walk and to Trevor for his excellent guidance along the Gangroad. The future of the Cromford Canal in the Ironville and Golden Valley areas was brought up for discussion, when a letter was read from the Inland Waterways Protection Society, an organisation which seeks to fully restore existing canals to navigable waterways, suggesting a “new cut” from Chesterfield to Pinxton Canal with a view to linking the canal system from Leeds to London. A letter from the Clerk, Mr. H Taylor, was read in his absence, in which he pointed out that there were two alternative resolutions. 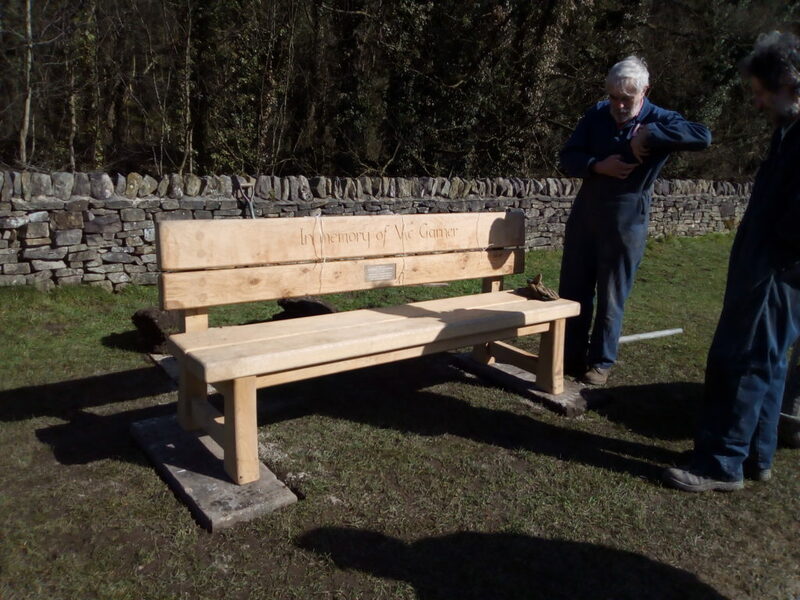 The first being that of supporting the Inland Waterway Protection Society for the restoration of the Cromford and Pinxton Canals, and deferring the question of Oaks Row Bridge at Ironville. The other that the abandoned and derelict canal at Golden Valley and Ironville to be filled in and consideration of it’s ultimate use as a roadway. Coun. 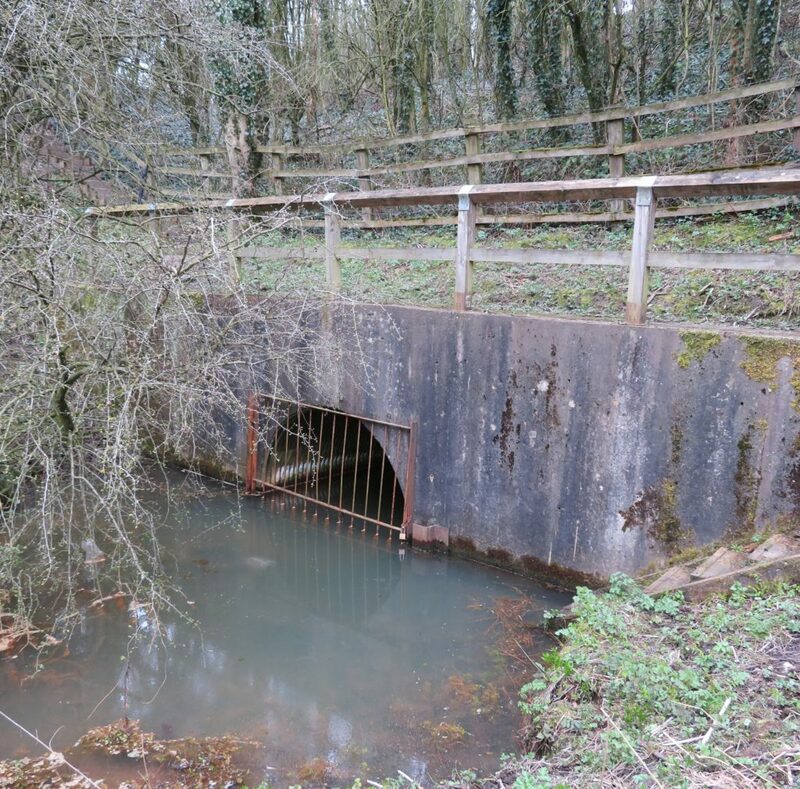 Rimmington said that as the council had been notified of the decision by the British Transport Inland Waterways that the Cromford Canal had been abandoned, the council had decided that the hump bridge at Oak-es Row had to go because of it’s danger to motorists and mothers pushing prams. Coun. Rev, Francis said that the canal was in a terrible condition, and that the bridge was a public danger. Coun. Peacock suggested that the matter be deferred until the Council could hear the views of the Clerk. This proposition was carried, and the question was deferred until next Tuesday. 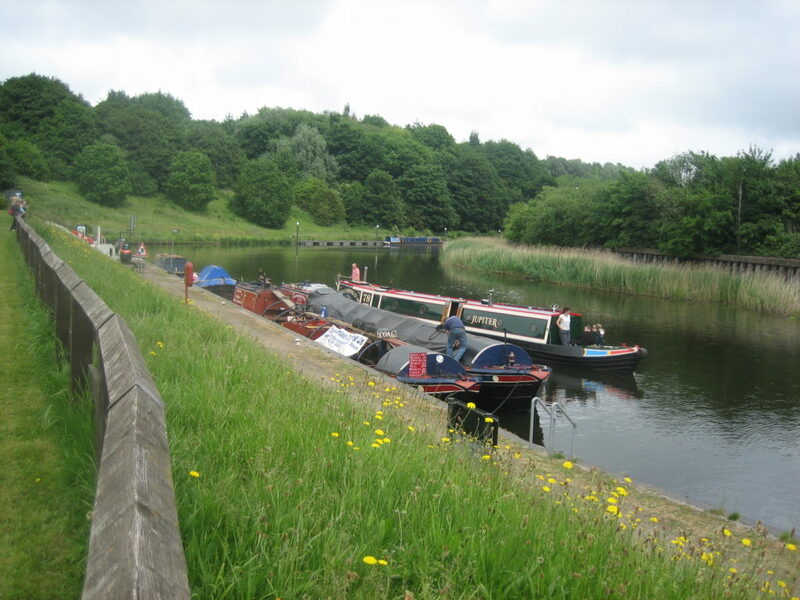 It’s 16 years since the last weekend walk on the Forth and Clyde Canal. 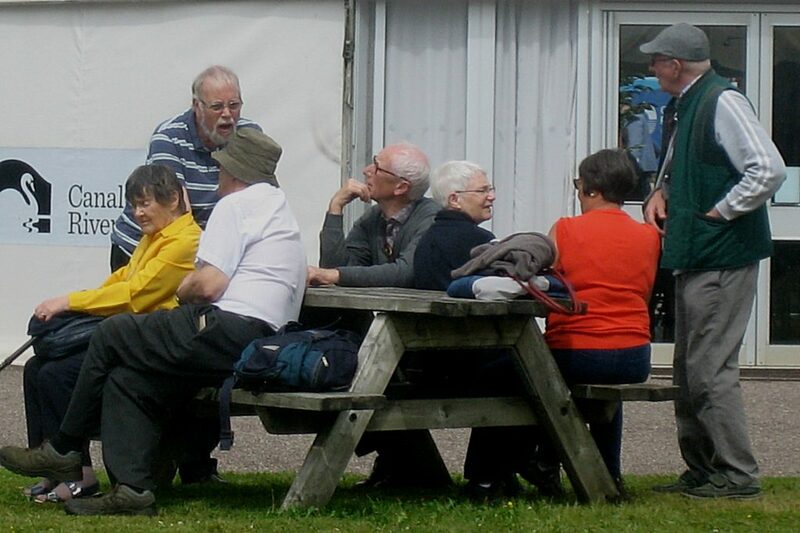 We weren’t able to attend then so it was very useful when Jan accidently stumbled upon the write up of that weekend. 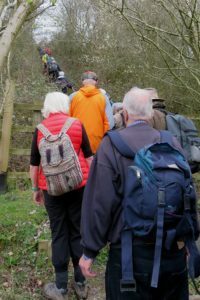 Although Saturday’s walk is going to follow the same route (but downhill this time) we think there are enough changes to make it interesting still for those who were there in 2002. FYI parking at both the Falkirk Wheel and the Kelpies has a charge of £3. Starting near the Falkirk tunnel we will walk through the tunnel and towards the Falkirk wheel, stopping to look at the old lock line and the new staircase locks before passing through Roughcastle tunnel which brings us out at the top of the impressive Falkirk Wheel, in our opinion the best position to view it from. In 2002 the lift and swing bridge were closed and a diversion had to be made, hopefully this won’t be the case this year and we’ll be able to cross the swing bridge.. The original plan was to have a lunch stop at the Union Inn but due to some recent reviews we are considering changing to the café at the Falkirk Wheel. We’ll be checking this out during the week prior to the walk. After lunch we walk down the 16 locks to the amazing Kelpies and see the new locks and channel down into the River Carron. The meal will be canalside at The Stables, Glasgow Bridge on the A803 just west of Kirkintillock (G66 1RH) . We will need a pre-order of starters and mains. There are several menus to choose from: Monday to Saturday/Fixed Price/Vegan/Weekend treat. When letting us know your choices please also say which menu your choice is from. We will meet at 10 a.m. at Maryhill Locks, parking on Bantaskin Street off Skaethorn Rd according to Bing maps/ Skaethorn Road off Cowal road if you’re using Google maps, Glasgow G20 0HF. OS ref: 564691 (map attached) then take a few cars to Port Dundas: Mid-Wharf St, Glasgow G4 0LD. OS ref: 593666. We hope to have use of the activity centre toilets here. The morning’s walk will take us from Port Dundas to the Kelvin Aqueduct with plenty to see on the way: Spiers Wharf with it’s Georgian Canal House and warehouses, Possil Road Aqueduct, Hamiltonhill Old Basin, WW2 stop lock, Firshill Basin timber pounds and the splendid Maryhill locks. This is an easy 3½ miles on wide, made footpaths. From here we drive to Dalmuir to view the drop lock then carry on to Bowling Basin with its Bascule Bridge, the disused but listed Railway swing bridge, Custom House, the old and the new sea locks and the basins. As everyone will have their cars at this point those needing to get straight off will be able to do so but there is also the option to join us on a short walk up to lock 37 which is dwarfed by the Erskine Bridge which crosses the river and canal. Welcome to our new-look website! Let us know what you think of its layout and design. 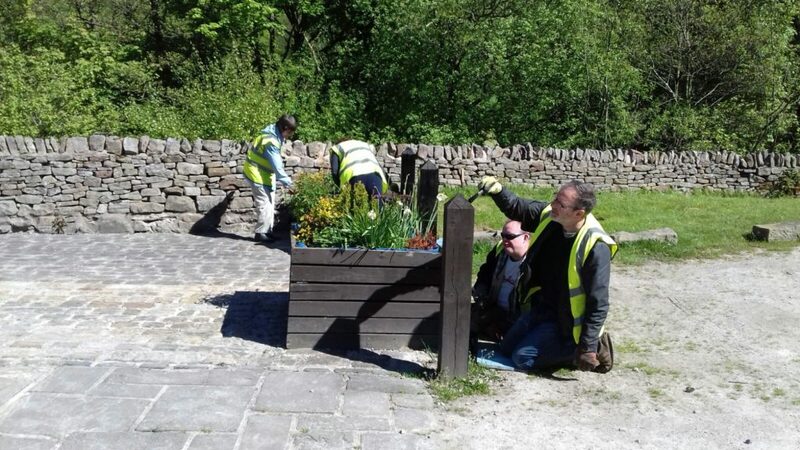 A snapshot of Don Baines’ brilliant old site from 31 August 2014 is available at archive.bugsworthbasin.org. Our more recent pages are archived at 2018.bugsworthbasin.org.